A pair of police officers busted a man from the suburbs of Orlando for allegedly possessing a derringer, which is a single-shot pistol, powder and crack cocaine, and pills early on Saturday morning. The stop began just before 1 a.m. when the officers say they were driving past Second Avenue and 38th Street and saw 51-year-old Mark Nickay, of Casselberry, Florida, standing beside a parked van drinking a bottle of Corona with 32-year-old Leonard Ndue of Chester, New York. The cops claim they saw Nickay throw a bag under the van and start to stroll off. Officer Christopher Neil caught up to Nickay while Officer Michael Papparlardo stopped Ndue. Nickay reached for the .22-caliber piece in his pocket, prompting the search that yielded the handgun, according to a police account. Ndue allegedly tried to block Nickay's arrest and got cuffed, too. With the pair of suspects restrained, the cops say they retrieved the bag and found 21 bags of powder cocaine, 10 bags of crack and "dozens of pharmaceutical pills." Nickay is being charged with six felonies including weapons possession and drug possession with intent to distribute. His bail has been set at $100,000 and his next court date is set for November 5th. Ndue was charged with obstructing governmental administration and resisting arrest. 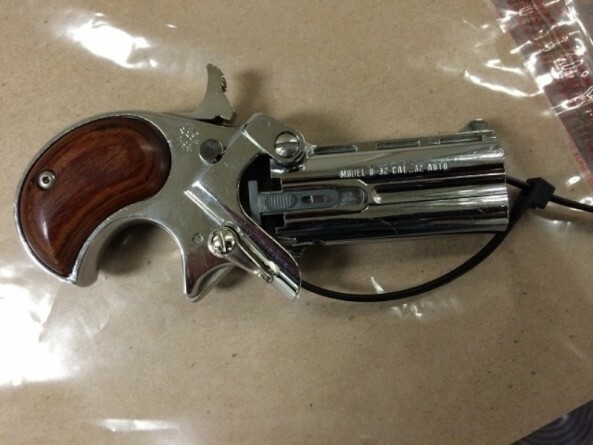 A similar stop at about 4 o'clock that morning sent another man to jail after police say they found two heavy-duty guns on him in Staten Island. Police say they stopped Robert Alexander, 33, of West Brighton, drinking out of a bottle of Lucent vodka outside of a Mariner's Harbor Houses building. A police spokeswoman recounted that the officers searched a bag Alexander had with him and found the two semi-automatic pistols, an Intratec AB-10 9 mm, a sibling of the famous Tec-9, and a Calico M950 pistol, dubbed by one YouTube user the "ultimate zombie defense gun." Alexander has not yet been arraigned, according to court records. He is facing five felonies and three misdemeanors, including charges of weapons possession, resisting arrest, and obstructing governmental administration, as well as an open container violation.